For use in laptops and desktop computers, WD Green SSDs offer high performance and reliability to boost your daily computing activities. With comprehensive WD F.I.T. Lab certification testing, WD Green solid state drives are compatible with most PCs. The free WD SSD Dashboard lets you monitor your storage, and when combined with the 3-year limited warranty, upgrading your digital storage is worry-free. 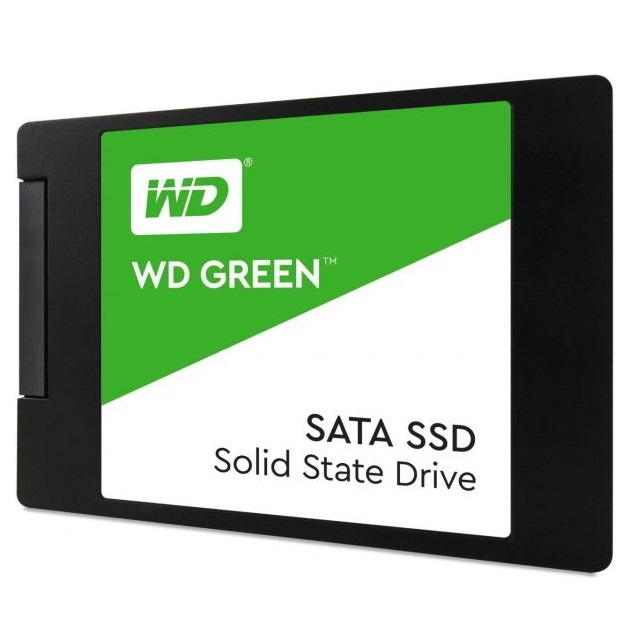 • Enhance your system with a WD Green solid state drive and help improve the performance of your laptop or desktop computer for your daily computing needs. SLC (single-level cell) caching technology helps boost write performance in a WD Green SSD to browse the web, play your favorite casual games, or simply start up your system in a flash. • Designed without any moving parts, WD Green SSDs are built to be lightweight and shock-resistant to help protect against data loss if a drive is accidentally bumped or dropped. Combined with the comprehensive WD Functional Integrity Testing Lab (F.I.T. Lab) certification, every WD Green SSD is tested to ensure it meets the highest WD brand standards for digital storage. And with no moving parts in a WD Green SSD, you get reliable storage to withstand normal wear and tear for years to come. • WD Green solid state drives are among the lowest in power consumption in the industry. And with less power used, you can run your laptop PC for longer periods of time. • The downloadable WD SSD Dashboard provides a suite of tools so you’re always able to check on the health of your solid state drive. Available for free, this WD SSD Dashboard helps you track things like disk model, firmware version, S.M.A.R.T. attributes, or simply find out how much space you have left on your WD Green SSD. • Every WD Green SSD comes with a 3-year limited warranty, so you can be confident of your storage when you upgrade or replace any of your drives.